While you may have come across lots of heater reviews that mainly focus on heating the home, there is one part of many people's property that often gets ignored in these reviews, and that is the garage. Rest assured we are not going to ignore the garage, and in this heater buying guide we will be giving what we hope will be all the information you need to help you choose a heater for your own garage. Choosing a heater for a garage is very different from choosing one for your home, for several reasons. They are constructed differently for a start, they are much smaller in size, and there's the not insignificant fact that you spend a fraction of the time in your garage, that you do in your home. Admittedly, there are some reasons why you may need or want to spend an hour or two in your garage, such as using a workbench or maintaining your car, but this is unlikely to be a daily occurrence. We are going to assume that you use your garage normally, as opposed to it having been converted into something else, like a spare bedroom or children's' playroom. With normal use you will likely park your car or cars in there at night, you may have a small workbench, storage for tools and car accessories, and a few miscellaneous items that you are keeping 'just in case' they are ever needed, even though you know deep down they never will be. Your garage will obviously have the main door which is likely made from wood, metal or possibly a composite material that looks and feels like plastic. The walls will be concrete, the roof slightly sloping, and the only other thing of note might be a normal sized door which either opens out into the yard or is connected directly to your house. All the above means that there are several heater types that are simply not going to be suitable for use in your garage. The most obvious one is an electric fireplace which would look ridiculously out of place, notwithstanding the fact that it would be virtually impossible to install one given that it would take up too much space. Obviously, the size of garage that each property has is going to differ somewhat, but for most, they are going to have dimensions compatible with either one or two cars being able to park in them. In addition, there may be additional space which could allow for a small work area, some storage, or both. We must also consider that some of you have a two-car garage but only one car, so you have lots of additional space. That's a reasonable point, however, at some point, the car will be back in the garage, and even if the heater isn't on, it will still need to be somewhere in there, unless you plan to take inside the house every time, which is very impractical. So, all this leads us to the conclusion that any heater you choose for use in your garage needs to be small enough to fit in the restricted space. This now eliminates many of the larger heaters that you might possibly consider including some infrared heaters which are often housed in bulky wooden-type cabinets. When choosing a heater for inside your home, the choice you have is massive thanks to the various types, how they are fueled, installation options and the many sizes that the heaters come in too. With the garage, the choice is somewhat simpler, which we hope you regard as a positive. There are basically three types of heater for a garage and these are categorized by the type of fuel that they use. These are gas heaters, electric heaters, and propane heaters. For each of these three, you will find that the design, construction, installation (if required) and means of operating them are very different so we are going to take each in turn and explain how. The first obvious point about electric garage heaters is that you are going to require an electrical supply in your garage. While most garages will have this, it may be that your garage was never connected to the supply, or it is some distance from the house and has the same lack of electrical power. Whichever is the case, you could use an extension cord for portable heaters, but this is far from ideal. This is especially true if you plan to use your garage a lot and need the heater on regularly. The chances of someone tripping over the cable and the inconvenience of having to run the extension every time is likely to become very frustrating. In the case of those electrical heaters which require to be hard-wired to the electrical supply, then it is obviously not going to be possible for you to use them if your garage has no power. The types of electrical heater that are best suited to a garage are those which are connected to the electrical supply and secured to a ceiling or wall. This means that they are up and out of the way, and therefore the issue about the amount of space you have in your garage is no more. Depending on the heater model, the power can be supplied via a standard power socket or in some cases the heater can require a hard-wired connection, in which case you may need a qualified electrician to help install it. These heaters can produce up to 6000 watts which equates to over 20,000 BTUs. That level of heat should be enough to make even a triple garage feel warm on the coldest of days. Another feature of these electric heaters is that although they are fixed, their direction of heat can be adjusted because the unit can swivel and some also have adjustable louvers. If you want to check out some of the best electric garage heaters and compare their many features, then you should read our Best Electric Heater for Garage Reviews. For those of you that either have an existing gas supply to your garage or are able to extend your gas supply to your garage, then these heaters will appeal. There will obviously need to be some consideration to ensure any gas installation is safe, which is why we recommend using only qualified gas contractors or engineers to install any gas piping, connectors or equipment. Some of the best gas heaters for use in a garage are fixed to a wall or a ceiling. As with the fixed electrical heaters, this solves the problem of limited space, as the heaters are not taking up any floor space. They probably have a bigger variety in terms of their construction than electrical heaters. The alternative to this is to use portable gas heaters fueled from a tank rather from the household gas supply. These are popular because they can be moved, however, you need to consider the space required for the tank if it is not housed in the heater, and the fact that the tanks will eventually need to be replaced. The heat output gas heaters in a garage can produce as much as 25,000 BTUs so they compare very well with electrical heaters. To see some of the top gas heaters which are most suitable for use in your garage head over to our Best Gas Garage Heater Reviews where you will get more detailed information on their specifications and features. Our third heater type for garages is propane. These heaters are fueled from propane tanks that are connected to them and normally sit near the heaters. For this reason, you need to take account of this when assessing the size of your garage. Another consideration is that some propane heaters use a fan to blow out the hot air, and as these fans are electric, you will need to have a power socket available in your garage. 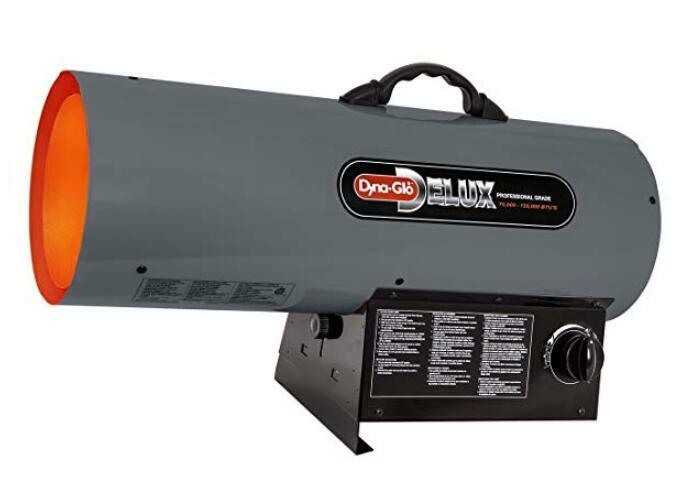 One of the main advantages of propane garage heaters is that they are nearly all portable. This gives you the option to move the heater from your garage to another location such as a workshop, or as an emergency and temporary source of heat in your home, should your main heating system ever fail. Moving a propane garage heater will either involve carrying it and as most of them are relatively small and lightweight this should be easy to do. Some even have a carry handle on the top of them. It is fair to say that there are many different types, sizes, and designs of propane garage heaters. They range from simple 6 lb. heaters that connect to the top of a propane tank, to forced air heaters that are capable of blasting out as much as 125,000 BTUs. Most of them will have electronic ignition to light them and give you the ability to adjust the heat levels. To discover more about all of them you should read our Best Propane Garage Heaters Review where you will be able to see the diversity we are talking about. You'll also be able to compare them in order to choose the right one for your garage. Now that we have given you some of the advantages and disadvantages of gas, electric, and propane garage heaters, for many of you the choice may come down to logistics rather than preference. For example, if you have neither a gas or electrical supply to your garage then a simple propane garage heater is likely to be your only option. Unfortunately, your choice may be restricted somewhat if you don't have electrical power in your garage as some propane heaters do need an electrical supply to power their fans, and there are some portable gas heaters which need electricity for ignition and other functions. Your choice will also be straightforward should garage only have a gas or an electrical supply but not the other. While these scenarios are relatively rare, they do exist, so if they exist in your garage your choice is going to between propane heaters and either gas or electric. The first aspect of propane heaters that might be seen as an advantage over some, though not all, gas heaters is that they are portable. If you think you may want the ability to use your heater in different locations then propane is normally the better option, even though there are one or two gas heaters that use tanks instead of being connected to the main gas supply. Bear in mind that many propane heaters have a fan to blow out the hot air, and with some heaters, this can prove to be very noisy. If you don't like the idea of a loud fan in the background when working in your garage then a gas heater will give you the peace and quiet you desire. If you want the most amount of heat possible then it is fairly safe to say that a propane heater wins hand down. Some of them have an output of over 100,000 BTUs whereas the most you are likely to get from a gas heater is around 25,000 BTUs. This also means that a propane heater will be more suited to larger garages which have a bigger area that needs heating. The points we made about noise levels and heat output levels in comparing propane to gas heaters, also applies when comparing them to electric heaters too. As for portability, it is even more so, as most electric heaters are fixed to the wall or the ceiling. Electric heaters may have a fan which blows the hot air, however, they are much quieter than those in propane heaters, so if you are averse to noise, definitely go for electric. Another advantage that electric garage heaters have is that they are virtually maintenance-free. Apart from occasionally cleaning off any dust in their louvers, you do not have the task of having to refill them as you do with propane. They should also start right away with the flick of a switch whereas propane heaters use electronic ignition which can occasionally take several attempts to get the heater up and running. The reason you need a heater in your garage is to heat it up so you'll obviously want to compare the heat output of any heater you are considering. When you compare this for gas and electric heaters you will see that there is not really much difference, with gas heaters capable of between 4000 and 30,000 BTUs and electric giving you between 10,000 and 20,000 BTUs. With some gas heaters using a tank of natural gas instead of the mains supply, you do have more to choose from in terms of portability. Bear in mind that some gas heaters require electricity for ignition and other functions so you'll need a power outlet in any other location you plan to use one of these. With the heat outputs being so similar between gas and electric you may want to compare the cost of running either of those heaters in your garage, so we will. We'll also include the cost of propane heaters so you can compare all three against each other. For every million BTUs of heat output, a gas heater will cost you $18, propane is around $30, and an electrical heater will cost about $35. These prices can change due to fluctuations in fuel and energy costs, but it is a good indicator of what they cost in relation to each other. Cost should not be the only factor that you use to make your choice, but instead, it should be considered along with all the other features that each garage heater type can offer you. In this way, your decision will be based on all aspects of the heaters rather than just one. It might be said that as a garage is such a basic part of any home, the choice of a heater that is going to be used in it, doesn't require any thought. Hopefully, our buying guide to garage heaters has shown you that not only is it desirable to think about it, but that it is necessary if you are going to purchase the appropriate heater for your garage. You have other aspects to consider such as the amount of space you have in your garage, especially if you ever need to heat the garage when your car is in there. This is where a garage heater which can be fixed to your wall or ceiling may be best for you. Alternatively, you may want a heater that you can use in more than place, and if that is the case then you'll want to check out those heaters which are portable. We have shown you heaters that can be fueled or powered in three different ways, and these choices will play a huge part in your decision. For a start, you will need an electrical supply, not only for those which are electric, but some propane heaters need power for their fans. If gas is your preference, bear in mind the options you have are to either used a direct connection from your domestic gas supply or portable gas tanks. For lots of additional information, and to read in-depth reviews of the best gas garage heaters, the best electric garage heaters, and the best propane garage heaters, click on the appropriate link.